Did you catch this news report on WBMM on Dec 10th? Way to go Abbie!! 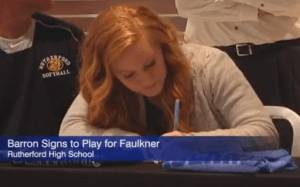 Rutherford’s Abbie Barron is taking her softball career to Montgomery Alabama to play for the Faulkner Lady Eagles where she will play second base. She is also a pitcher for the Lady Rams with 208 career strikeouts. Barron has been a huge part of the Rutherford softball team with a career batting average of .377 as well as 93 hits, 59 RBIs, 78 Runs, and four home runs. 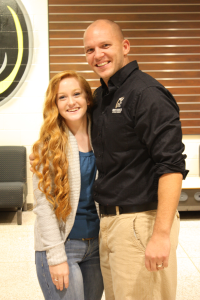 She has been on the All-State Team for the past three years and All-Academic Team for the past two years. Last year Abbie and the Lady Rams making it all the way to the Regional Quarterfinals and finished the season with a 19-8 record. Abbie said she is very thankful for the opportunity to take her talents to the next level. “It’s just an unbelievable opportunity. I’ve been playing since I was six years old and this has been my dream and I couldn’t be more excited about it. Faulkner was just… I stepped on campus and it was just like I belonged there. So on the softball field it just felt like I was at home,” said Barron.